Marc Webb directs Joseph Gordon-Levitt as Tom Hansen and Zooey Deschanel as Summer Finn, the inspiration for the title of the movie. Tom is a greeting card copy writer who has become so caught up in his verses that when he meets new office employee Summer is instantly love-struck. What follows is a cute synopsis of their 500 days of ups and downs. Summer, you see, is a freer spirit and is fine with that nebulous commitment best termed 'friends with benefits'. When fate intercedes and she meets the man of her dreams, Tom is forced to realize sometimes love-struckness can be one-sided. 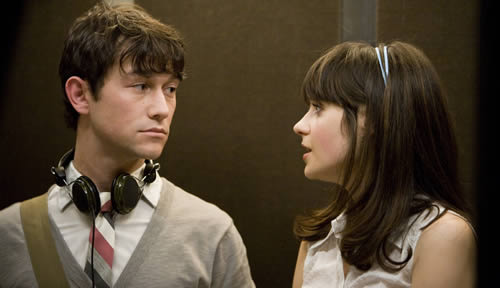 500 Days of Summer is a very good film that uses an inventive storyline complemented by fine acting to relate one of the great truths of dating - often you're not 'the one', but 'the one' is out there.